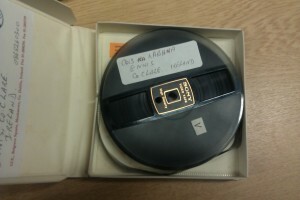 We have recently been sent a Sony V62 high density video tape by Barrie Hesketh. Barrie has had an active career in theatre and in 1966 he set up the Mull Little Theatre on the Isle of Mull off the West Coast of Scotland with his late wife Marianne Hesketh. Specialising in what Barrie calls the ‘imaginative use of nothing’ they toured the UK, Germany and Holland and gained a lot of publicity world wide in the process. Both Marianne and Barrie were awarded MBEs for their services to Scottish Theatre. You can read a more detailed history of the Mull Little Theatre in this book written by Barrie. 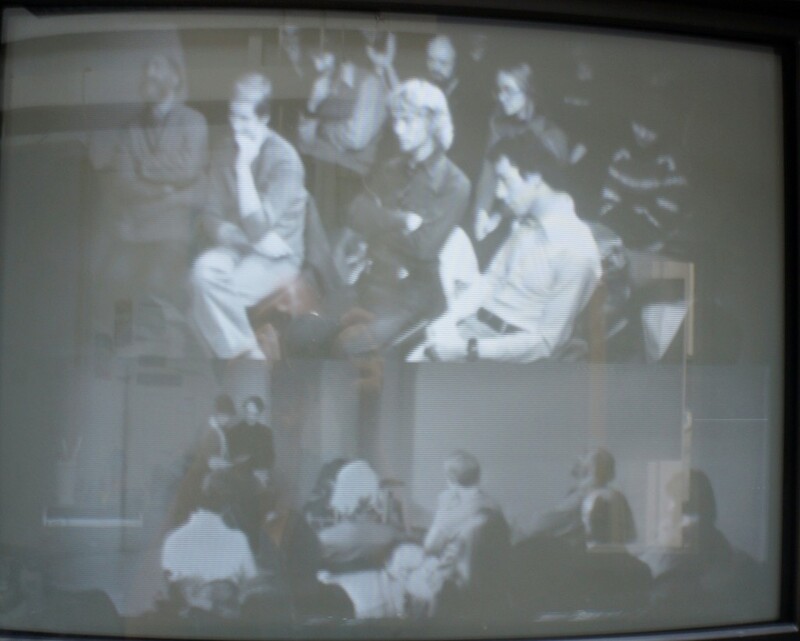 The video tape Barrie sent us came from when he and Marianne were working as actors in residence at Churchill College at Cambridge University. Barrie and Marianne had what Barrie described as ‘academic leanings,’ gained from their time as students at the Central College of Speech and Drama in London. Recording audience responses was a means to sharpen the attention of actors. He was particularly interested in the research to identify ‘includers’. These were individuals who influenced the wider audience by picking up intentions of the performers and clearly responding. The movement of this individual (who would look around from time to time to see if other people ‘got it’), would be picked up in the peripheral vision of other audience members and an awareness gradually trickled throughout. Seeing such behaviour helped Barrie to understand how to engage audiences in his subsequent work. Barrie’s tape would have been recorded on one of the later reel-to-reel tape machines that conformed to the EIAJ Standard. The EIAJ-1 was developed in 1969 by the Electronic Industries Association of Japan. 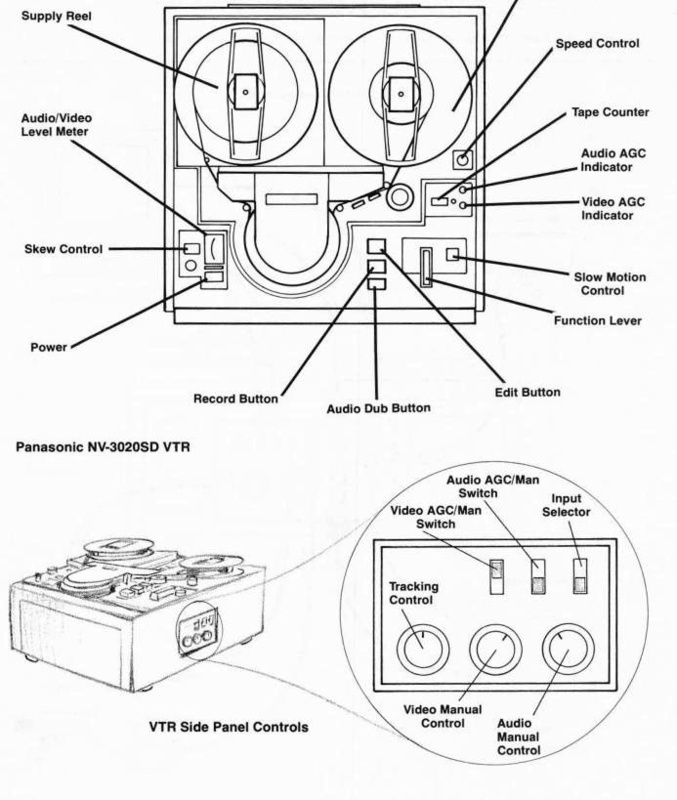 It was the first standardized format for industrial/non-broadcast video tape recording. Once implemented it enabled video tapes to be played on machines made by different manufacturers. 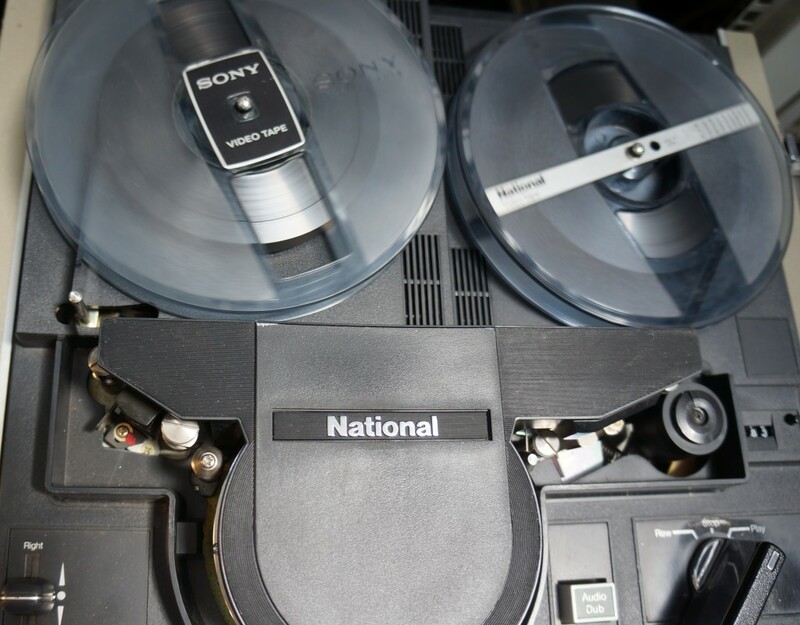 Prior to the introduction of the standard, tapes could not be interchanged between comparable models made by different manufacturers. The EIAJ standard changed all this, and certainly makes the job of transferring tapes easier for us today! Imagine the difficulties we would face if we had to get exactly the right machine for each tape transfer. It would probably magnify the problem of tape and machine obsolescence effecting magnetic tape collections. In the Great Bear Studio we have the National Panasonic Time Lapse VTR NV-8030 and Hitachi SV-640. Like Ampex tapes, all the Sony EIAJ tape tend to suffer from sticky shed syndrome caused by absorption of moisture into the binder of the tape. Tapes need to be dehydrated and cleaned before being played back, as we did with Barrie’s tape. The tape is now being transferred and Barrie intends to give copies to his sons. It will also be used by Dr Richard Trim in an academic research project. In both cases it is gratifying to give the these video tapes a new lease of life through digitisation. No doubt they will be of real interest to Barrie’s family and the wider research community. We were recently contacted Frank Whelan of the Comhaltas Regional Resource Centre who wanted us to digitise a recording of the Fleadh Cheoil traditional music festival in Buncranna, Co. Donegal in 1975. Frank sent us an EIAJ ½ inch video that was recorded on a Sony High Density V-60H video tape for Helican Scan Video Tape Recorder. The tape was suffering from binder hydrolysis (often referred to as sticky shed syndrome), so needed treatment before it could be played. The tape was incubated and cleaned before the digitisation process. The recording contains fascinating footage of solo and group performers from the biggest traditional Irish musical festival in the world. The first Fleadh Cheoil took place in 1951 and has happened every year since. Comhaltas are currently collecting archive material for every year the festival was held in order to create a document for future generations. The digitised film will go towards an exhibition and will be stored in a research facility focused on Irish traditional music. This is an excerpt of the film that Frank kindly said we could use on our site. 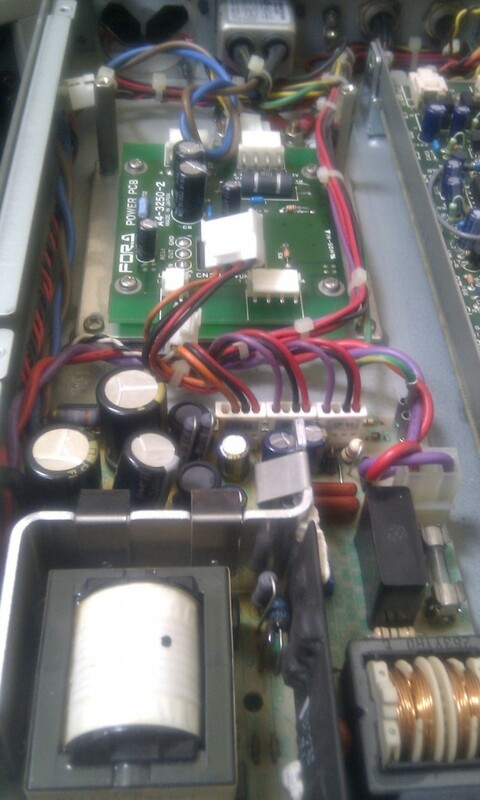 We use time base correctors and frame synchronizers all the time in the transfer and digitising of analogue video tape. One of our more flexible and high quality units had recently developed an annoying and very obvious fault on it’s video outputs. While the unit was working there were faint but distinct horizontal lines on the video. This phenomenon is often called a hum bar and can be caused by ground loops. In this case we isolated the unit from the rest of our installation and using a separate power point the problem was still there. Looking at the unit itself it is a very deep and heavy 1U case with two 40mm cooling fans at the rear corners. It is quite old too and being designed for continuous studio use is likely to get hot and have been on for very long periods. The video fault appeared to be AC ripple ‘riding’ on the DC power. It was time to look at the electrolytic capacitors in the power supply. The only one hard to find was the large 400v dump one. Most units now are thinner and taller but eBay came to rescue here. This shotgun approach worked beautifully and the fault had gone. While tracing the exact fault is always the best way, capacitor often get a hard life and will not last indefinitely, especially in switch mode power supplies. A recent addition to our video arsenal is this rare 1976 vintage 1/2″ colour reel to reel machine. This has needed some work to get it functioning well such as new belts, hardened grease cleaned off the mechanism, etc but is now able to transfer colour recordings made in this format of reel to reel video. A more detailed article on the repair of this will appear soon as will information about our other reel to reel video machines, the Hitachi / Shibaden EIAJ machine, the Sony CV-2100 skip field VTR and the enormous Ampex VPR-2B 1″ video machine… and we’ve got two of these! 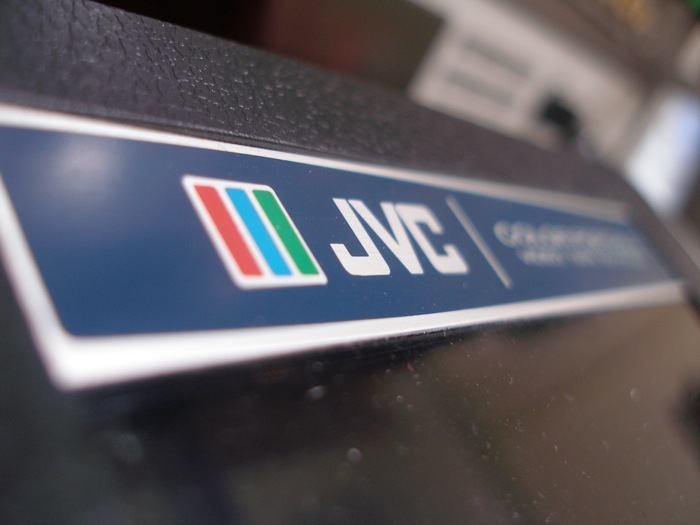 Thanks to Rich at www.labguysworld.com for the JVC service manuals. You are currently browsing the archives for the reel to reel video category.